US markets traded higher on Monday with all three major indices closing at record highs. The Dow Jones, S&P500 and Nasdaq closed up 0.10%, 0.15% and 0.30% respectively. The indices were boosted by a 3% jump in the oil price with WTI now pressuring the $58 level, with Brent settling at $65. Are we back in the “Boom times”? At the centre of any bull market is a rise in corporate activity and the fact that Broadcom has now gone hostile in its takeover offer for Qualcomm speaks volumes about the where the market temperament is headed. We are not yet at the ‘euphoric’ stage (it pays to remember Sir John Templeton’s quote – bull markets die on euphoria) but clearly, the market is getting excited about M&A. Too much of that can be a bad thing. Investor optimism is also being driven by the Republican proposal last week to slash the corporate tax rate to 20% from 35% and end some tax breaks for companies and individuals. Also driving stocks has been the US quarterly earnings season with now more than 400 S&P 500 companies having filed earnings reports for the third quarter. The results are looking impressive with current consensus that growth came in at 8% – well ahead of the Wall Street’s estimate of 5.9% at the beginning of October. This in itself has been enough to drive the rally in US stocks. Crude has continued to rally, along with commodities generally. Nickel surged yesterday to multi-year highs, while copper and iron ore prices have also rallied. BHP ADRs were up over 3.3% in the US on Monday. Brent crude traded at fresh two-year high on Monday at US$65 a barrel while WTI crude traded at US$58 a barrel. Both oil benchmarks have been supported by recent political uncertainty in Saudi Arabia. Dozens of royals and businesses tycoons were arrested over the weekend, which effectively tightens the Crown Prince’s grip on power and Saudi’s oil production. Crown Prince Mohammed is planning reforms that include an IPO to list parts of state-owned oil company Saudi Aramco next year. Higher oil prices are beneficial for the IPO and the market valuation of the future listed company. Iron ore prices rose by as much as 5.7% in China on Monday and briefly hit US$70 a tonne or Rmb464. Prices hit a four-month low at the end of October and had been over Rmb600 a tonne in mid-August. Gold and silver also lifted 1% and 2.4% respectively. 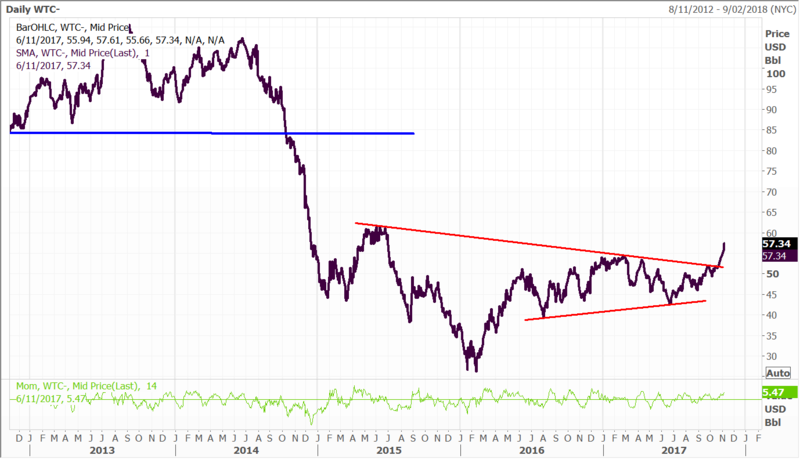 WTI Crude has extended to the upside following last month’s breakout. $60 should prove to be the ceiling in terms of resistance over the near term. Asian markets were mixed on Monday with the Nikkei closing 0.04% higher at 22,548. In Australia the ASX 200 closed 0.1% lower at 5,953 and in China the CSI 300 closed 0.71% higher at 4,020. Japan’s services sector grew at the fastest pace in more than two years in October as new orders accelerated sharply, indicating the resurgence in the economy is accelerating as we head into the middle of the fourth quarter. The Markit/Nikkei survey released on Monday showed its Japan Services Purchasing Managers Index (PMI) rising to a seasonally adjusted 53.4 from 51.0 in September. The index remained above the 50 threshold that separates expansion from contraction for the 13th consecutive month and was also at the highest level since August 2015. In the wake of Shinzo Abe’s election victory, confidence continues to run high, and this is what Japan’s corporate sector has so badly needed after a number of false starts over the past three decades. The composite PMI, which includes both manufacturing and services, also rose to 53.4 from 51.7 in September to reach the highest level in five months. Bank of Japan Governor Haruhiko Kuroda said on Monday that economic growth is gathering momentum and increasing the chances of inflation hitting his 2% target. This is reinforcing market expectations that no additional stimulus is forthcoming, but existing measures will remain in place. Reading between the lines, at some point the BOJ will roll back the Negative Interest Rate policy, and this will have a powerful positive impact on the banking sector. Under a policy framework adopted last year, the BOJ now guides short-term interest rates at minus 0.1% and the 10-year government bond yield around 0%. We own many of the Japanese banks in the Fat Prophets Global Contrarian Fund and our Global Opportunities and Asian Managed Accounts. Sumitomo Mitsui Financial Group, one of the top 3 banks in Japan, and one of the names we hold in our portfolios. Mr Kuroda also conceded the BOJ’s huge buying has led to “very low volatility in Japan’s bond market that could exacerbate market swings”. When the inflection point finally arrives in Japanese Government Bond yields, I believe the ensuing rally in Japan’s banking sector could be explosive, unleashing the crippling impact of three decades of deflation. Sony’ continued their strong run yesterday, gaining 3.3% in Asian trading to take their ascent over the past five trading days to 22% and gain year-to-date to 60%. This largely seems to be continued momentum following the release of a strong quarter and the lifting of full year operating profit guidance to a record ¥630 billion (US$5.6 billion) for the fiscal year ending March 2018. 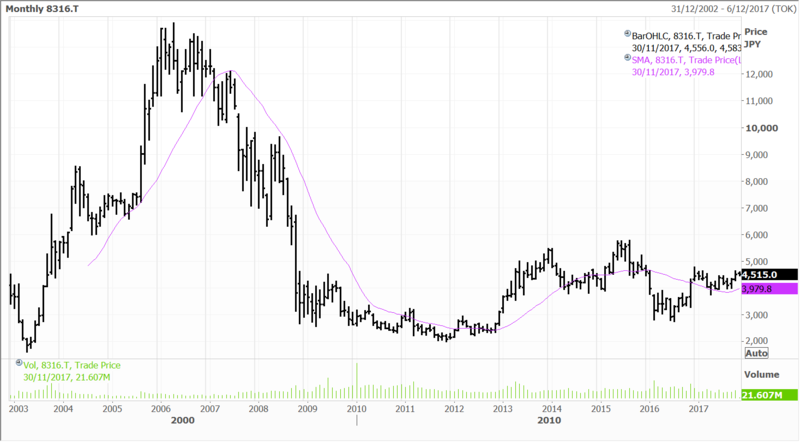 Sony is a core holding in the Global Contrarian Fund, along with the Global Opportunities and Asian portfolios. Only a few months ago Sony had forecast profits of ¥500 billion for the year. If Sony hits its new target, it would see the company surpass its record ¥526 billion profit set way back in the year ended March 1998. Besides these major factors, sentiment to Sony seems to have been given a boost by the return of its robot dog, aibo. The entertainment robot was first introduced back in 1999 and the media loved it, as it became a symbol of the integration of robots into the home. It was ahead of its time though and was discontinued during a restructuring of the business in 2006, much to the dismay of its many fans. With advances in artificial intelligence and robotics since, aibo may make a more meaningful impact on Sony’s bottom line this time around, and at least return its brand to some of its former Walkman era days. 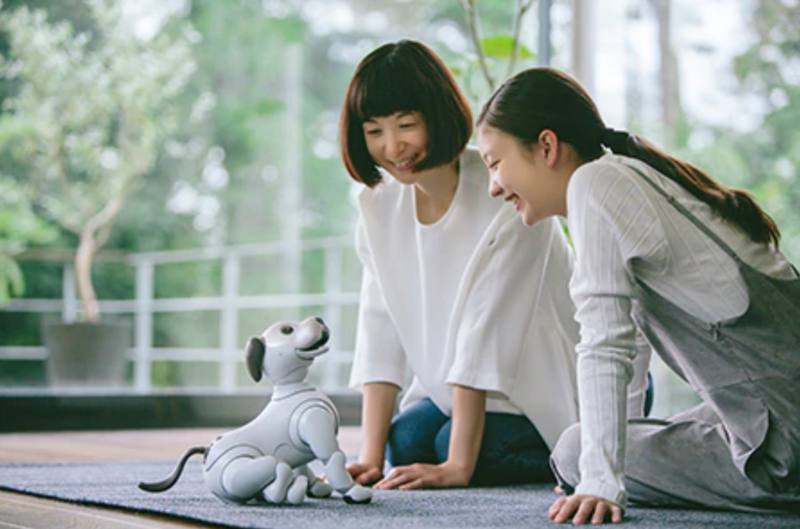 Aibo retails for about US$1,700 and the first batch of pre-orders reportedly sold out in 30 minutes online. There is also a subscription plan to keep your electronic canine’s artificial intelligence up to date using the cloud. Disclosure: The Fat Prophets Global Contrarian Fund declares a holding in Sumitomo Mitsui Financial Group, BHP and Sony.